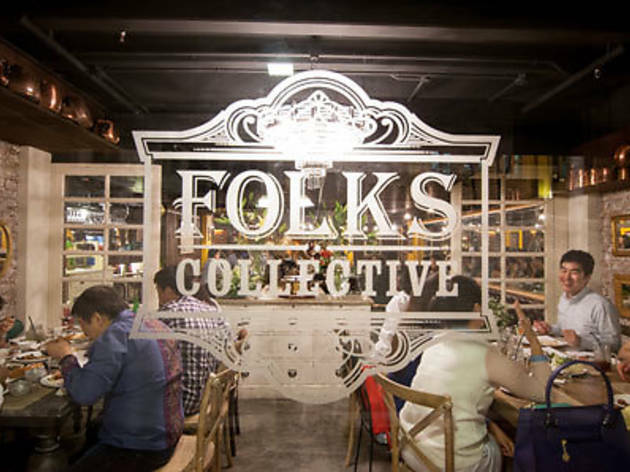 Ultra hip vibes and comfort food from the Land of Smiles make for an unlikely combination, but the cool cats over at Folks Collective have pulled it off – China Square Central’s newest entrant along Nankin Row – is the epitome of vintage never going out of style. 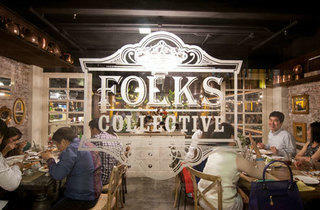 Thai native Akira Monthienvichienchai, who owns two cocktail bars in London, and his clan (consisting of his parents and brother Ralph) were inspired by the lesser-known, antique-laden Rod Fai Market in Bangkok, behind the notorious Chatuchak. First, pick up a playful tipple (from $12) with cheeky names like Even Thai Girls Cry, consisting of grand marnier with campari, peach and lychee syrup and pink guava juice ($18), at the narrow bar (you can’t miss the retro jackpot machine by the entrance), which gives way to a spacious 100-seat space with three themes – old Hollywood, vintage train station and a traditional Chinese medicinal hall – decked out with old school posters, mismatched furniture, an assortment of cool knick knacks and even a chest of wooden medicinal drawers. Folks Collective’s six Thai chefs cook what they know best, with some fusion fare thrown in – the East-meets-West Siam Spaghetti comes in three variations: chicken in Thai basil, black pepper beef or pork belly with kai lan ($8.90), while an appetiser of crispy shrimp pancakes dipped in plum sauce impressed; there’s also your requisite mouth-puckering Thai salads ($5.90- $12.90), curries ($8.90) and sharing plates of chicken and seafood. Desserts tempt, too – a delightful chocolate brownie is drizzled in fragrant Thai tea syrup and served with coconut ice cream ($5.90). And with five set lunches (available from 11am-8pm) priced at $9.90, it’s bound to be a popular spot with the office crowd, although the quirk factor really goes into overdrive at night with their alfresco area – a motley collection of vintage wheels, with a Volkswagen van doubling up as a dessert bar.